Independent Domestic Abuse Advisors (Idvas) support victims of domestic abuse to become safer, sooner. They work tirelessly to be an advocate for victims at their most vulnerable. When someone discloses about an abusive partner/ex-partner/family member – they may need to engage with a whole host of confusing and sometimes conflicting services: the courts, probation, housing, mental health, children services, substance misuse. It is never as simple as ‘just leave’. Idvas are their rock; they navigate these services. They work with local specialist services to provide longer-term support for women. They don’t talk for victims of domestic abuse, but in partnership with them. We train Idvas. We advocate for Idvas. We also listen to them. 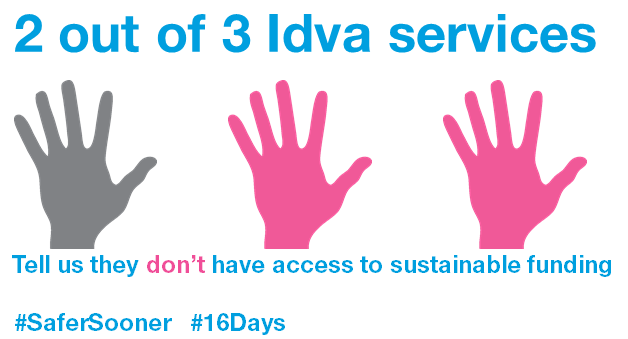 For the last three years, we have gone out to Idva services across England and Wales to find out how many Idvas are working in England and Wales, and the pressures they face. We use this insight from services to better understand what it is like for Idvas, and to do everything we can to support them so they can provide the best possible services to their clients. We know Idvas work to make people safer; we need them to be able to give the quality service that you would want for your best friend, for your sister, for yourself. Idvas want to provide victims with this level of support; we need to ensure they are able to do so. We will be publishing our full findings throughout our #16Days #SaferSooner activity.